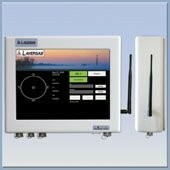 Laversab’s latest Atex-certified Zone-1 and Zone-2 rig-floor computers are specifically designed to overcome challenges presented by drill rig environments. The compact, lightweight Model 2950 is designed to be Intrinsically Safe (IS) for Zone-1 applications, features an Intel Atom processor and uses a solid-state drive for storage, enabling it to withstand severe vibration. Units include a 15-inch sunlight-readable display with auto-dimming, coupled with a touch-screen, and are compatible with various interface configurations. Laversab, Inc.